WHAT AN EXPERIENCE! Timothy Lewis and Kathryn Grant of the Ottawa National Diving Club were selected to represent Team Ontario last week based on their performances at Provincials. Their performances also secured a spot for Brennan Villemaire to represent Team Ontario as the Male Coach. The three of them travelled to Cuba for an international competition. The Copa Yumuri competition played host to athletes all across Canada, Cuba and Chile. Overall, Team Ontario was represented very well by all of the athletes. As a team we secured the Second best team of the competition placing behind Team B.C by only one silver medal but also having two less athletes. Kathryn Grant and Timothy Lewis showed strong performances overcoming natural elements along the way. The sun and the wind added a different edge to the competition. Competing with winds and very sunburnt, Kathryn Grant was able to persevere and obtain a personal best on tower of 256.00 and take home the gold. On the 1m event she finished with a bronze medal slightly missing her front double putting her only 10 points behind first place. On the 3m event she showed a strong performance through her compulsory rounds. After having an amazing jump on her inward double she missed the entry. After coming out of the water with tears she listened to her coach and refocused showing that she was far from being done. She absolutely nailed her last dive to climb her way back up the rankings to bring home her second Gold Medal of the competition by 0.5 points. She demonstrated great abilities that only great competitors have. To be able to forget the past and come back strong for the rest of the competition. 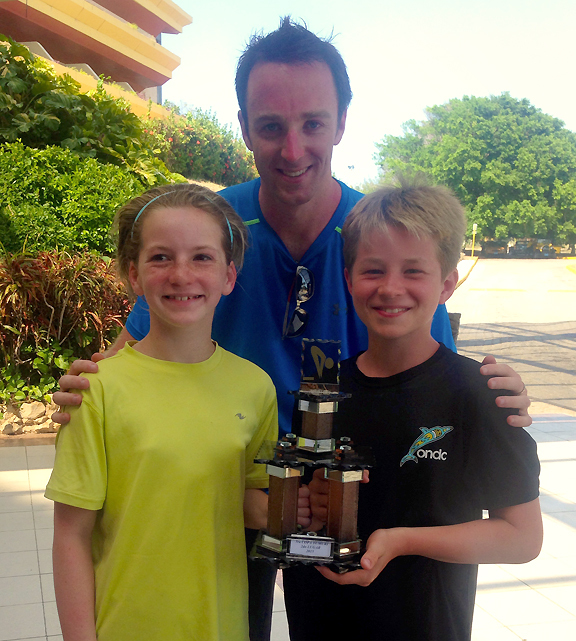 Her performances in her events earned her the award of “Outstanding Diver – Girls 10-11” Congratulations Kathryn! Timmy had a bit of a rocky start on the 1m board showing a strong performance for his age group but not on the level he knows he is capable of. He finished his 1m event in 4th place. Going into his tower event he showed determination and was ready to go. His compulsories were fantastic and was competing neck-and-neck with a fierce competitor from B.C. After the best takeoff for inward two and a half he has ever done he slightly missed his opening spot and went over. Similar to Kathryn, he showed that he was able to refocus and push through the last round of dives. His last dive, back two and a half on 7m is extremely difficult. To put it in perspective, there is no other athlete across Canada, Cuba or Chile that was performing that dive in this category. He did the best one he has ever done in competition earning him 7’s on the dive. He finished the event with the silver medal by only 10 points. With a little fine tuning he will be ready to go for the National Championships. Timmy was in a league of his own on 3m having the hardest difficulty of dives in the event. Timmy showed great consistency throughout the event and took home the Gold Medal. Congratulations Timmy. All in all the ONDC couldn’t be more proud of our athletes in and out of the pool showing they are strong athletes and amazing people to work with. Congratulations Tim and Kathryn!